The persimmon fruit is bright orange in colour and has a shiny and smooth skin. The persimmon tree, also known as “Khaki” tree, belongs to the genus Diospyros in the Ebenaceae family. Originally, persimmons were cultivated in Japan and the northern regions of China. Today, this fruit is also grown in the warm and mild Mediterranean climate and the United States. There are many delectable varieties of persimmons that make their way into our supermarkets during the winter months. The most common ones are the Hachiya and the Fuyu. The Hachiya can be recognized by its flat base and rounded egg shape top. It contains high levels of tannins and is highly astringent; it cannot be eaten when it is hard. Although they are shipped in this manner, you must allow the fruit to ripen fully before you can sink your teeth into the soft, jelly-like and dense texture that is “oh so good” and incredibly sweet. The Fuyu is shaped like a tomato and has a firm flesh even when it is ripe. It contains less tannins, and has a more delicate, vanilla-like flavour. The Fuyu is not as sweet as the Hachiya but it is still very delicious. You can slice it and eat it like an apple. Persimmons are rich in vitamin C, vitamin A, potassium, phosphorus, calcium and beta-carotene, which protects our body from illnesses and infections by stimulating the immune system. What is amazing about persimmons and especially the persimmon trees is that the plant has natural anti-parasite and anti-fungal properties. This means that no pesticides or other dangerous chemical treatments are required to grow these beautiful and luscious fruits. They are organic and you can go ahead and savour every morsel of this delectable fruit without the risk of endangering your health. Persimmons contain more natural sugars than cherries, grapes and bananas. They contain 20g of carbohydrates and only 70 calories per 100g of fruit. 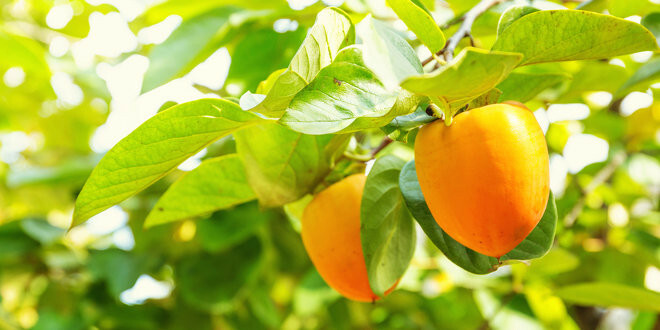 The persimmon fruit can be used in salads and desserts. You can add the pulp to a blender and add a little sugar to make a persimmon puree and drizzle over cakes, frozen desserts and even rice pudding. 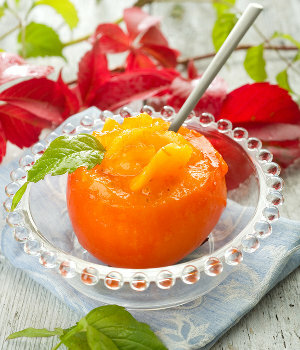 You can also make persimmon jams by replacing berries or fruit with the puree. Some other favourites are persimmon breads and persimmon cookies. The combinations are endless! Give persimmons a try today! Previous Kamut Or Khorasan Grain?